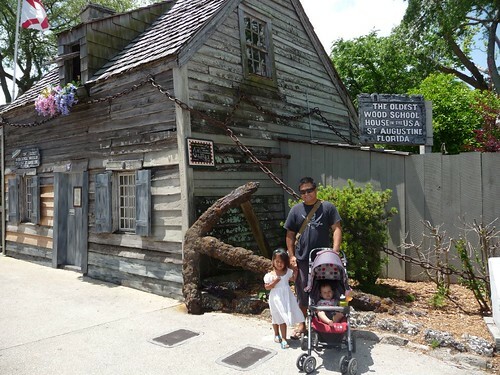 Mali Mish – Day 77: St. Augustine and our last night in Florida. Our night in the parking lot of the Flying J just outside of St. Augustine was great. We had obviously no hook ups of any kind but we felt safe and had a great connection with our Sprint Air Card which allowed us to get a bunch of work done. 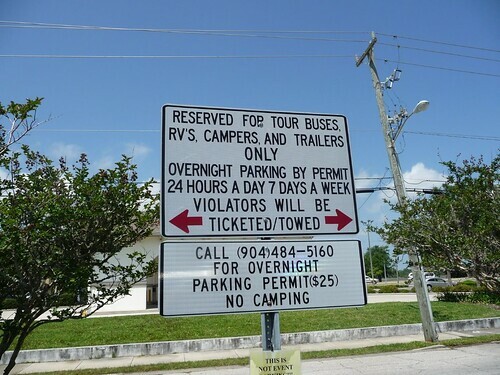 Thinking back, I don’t think we have boondocked in a parking lot since the night before our visit to Sanibel Island at a Walmart in Fort Myers. That was a month and a half ago. Something that Mila wasn’t yet doing then is sitting up or even pushing herself off of the ground. Look at her now. She is finally starting to crawl! By the time we get home, Mila would have lived half, if not most, of her life in Mali Mish. Just as we did last time at a Flying J, we breakfast at the buffet before we left. Surprisingly, it is very fresh and delicious. For only 7 bucks, you wouldn’t expect much but they actually have a reasonably large selection of food. 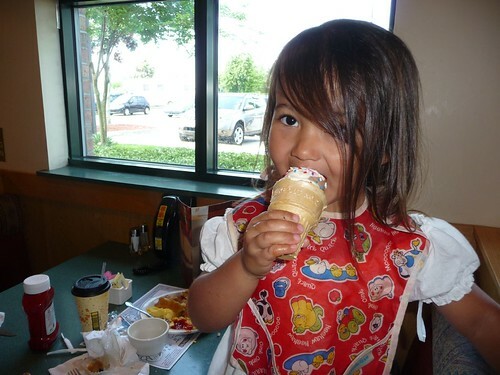 The only thing Ava was really excited about was the soft serve ice cream with rainbow sprinkles. Surprise, surprise. There is just something about not paying for a night of dry camping. It gives you even more of a sense of independence knowing that you are not tethered to anything and can still be comfortable. It’s been a long time and we will hopefully be doing more of it. Pulling into St. Augustine we didn’t quite know what to expect. 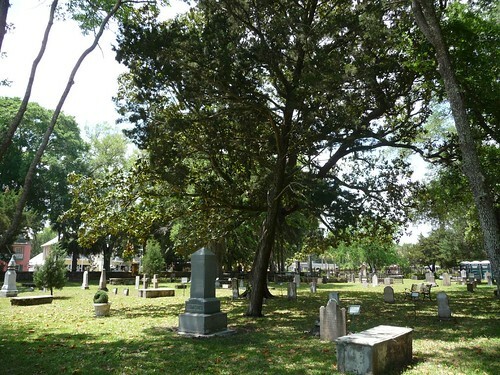 We have heard that being the oldest settled city in the U.S., it had narrow roads and lots of one-way streets. Since we had to pull the Airstream with us, we were worried about where we could park it. After driving around the town once with no luck of street-side parking, we found a parking lot owned by the city that is reserved just for people like us! It is very close to the visitors center and best of all, FREE! Today was an incredibly hot day in Florida. Just the short walk we took from the parking lot to the visitors center had us beading up with sweat as we walked in to the air conditioned visitor’s center. 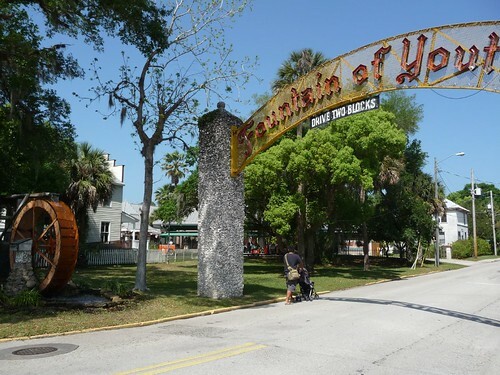 Most of what you can do in St. Augustine costs money. Being a town with a lot of history, it is a town that survives primarily on tourism. Even this cemetery next to a church had a guy sitting in a chair collecting ‘donations’. 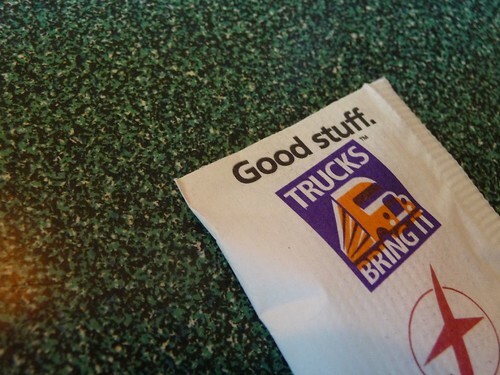 No thanks, we can see it just fine here. 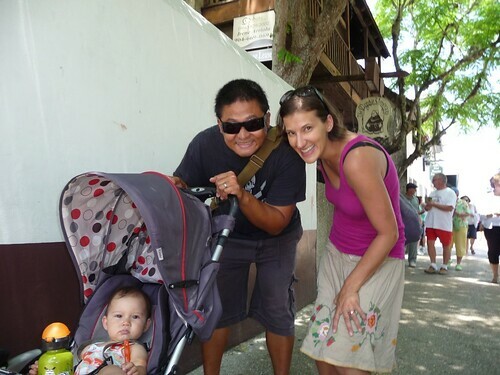 We opted to not take the popular guided mini train city tour that drives you everywhere. Instead, we thought we would just walk. On this hot day, we should have known better. In the middle of the downtown area, there is a street that is closed off to cars for pedestrians only. It has shops, restaurants, bars and this little wooden shack that is suppose to be the oldest wood school in the U.S.. Don’t you just love that. Oldest ‘Wood’ school. Always qualifying. 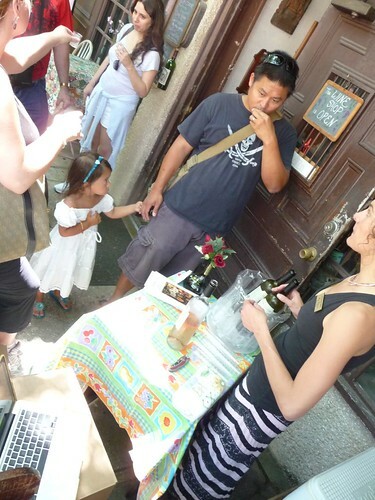 A few doors down I found a wine shop with a little tasting table outside serving up some local Floridan wines. The weather in Florida does not allow wineries to produce the drier varieties like we have in California so they tend to be very sweet. They had a red, a rosé and a white all made from the same local grape. The name escapes me but it is suppose to be very riesling-like. For some reason, I was getting a distinct taste of….. crab. Maybe there’s something they are not telling me. Here we are just down the street from the wine shop. Why are we ducking for this picture you ask? Well, Ava asked to take our picture and both Marlene and I apparently sensed that she was holding the camera a little low. 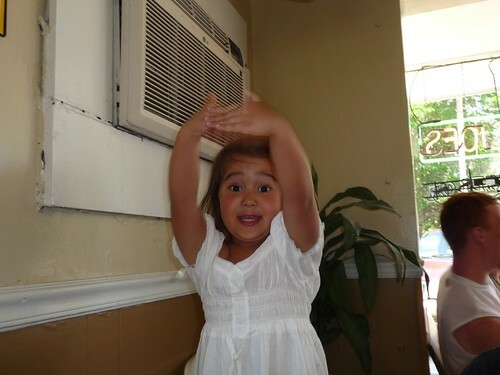 Nice picture Ava! 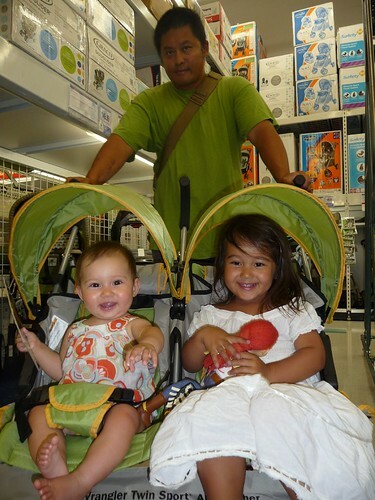 Even Mila was looking at the camera. 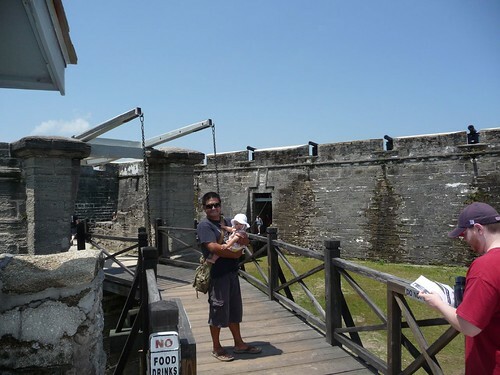 The most prominent sight-seeing destination in St. Augustine is the Castillo de San Marcos National Monument. 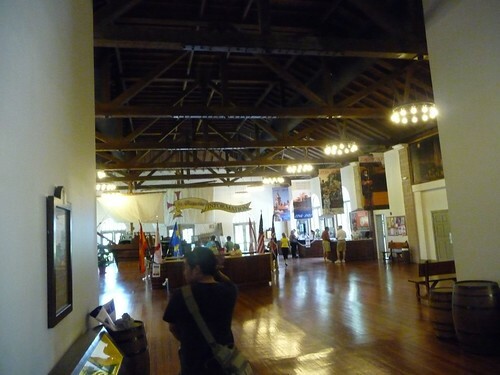 Located right at the waterfront, it served as the primary fort for the protection of the settlement. Finally, we got to use the National Park Annual Pass we bought for $80 in Padre Island National Seashore way back in Texas. 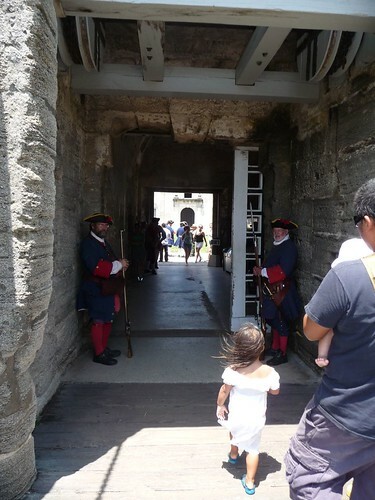 Free camping, free parking, free wine and now complimentary passes to the fort. Nice change of pace after the hurt the Florida Keys and Disney World put on our pocket books in the last 3 weeks. Attention! Princess Ava is now entering the castle. 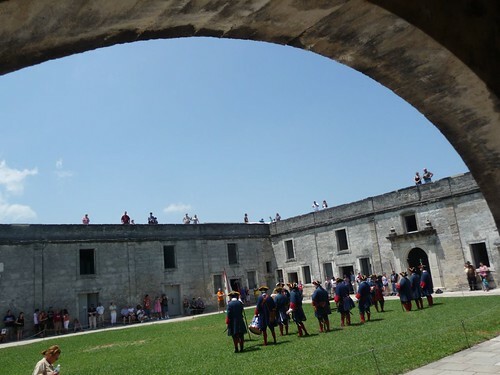 The Castillo de San Marcos fort was built back in the 1600s by the then occupying Spanish settlers. One of the interesting things we are starting to see in this part of the country is the usage of a building material consisting of sea shells, limestone and sand. With mid 17th century technology, it took the Spaniards 23 years to complete the construction. You would think in 23 years, they would come up with something better than straw in a sack to sleep on. 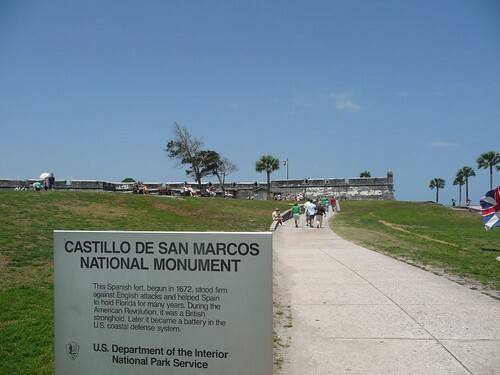 Castillo de San Marcos over the years have been under occupation by various powers. Started out at the beginning as a Spanish fort. In the mid 1700s, British settlers through the signing of a treaty, managed to take control of Florida. Only about 20 or so years later, after the American Revolution, it was once again returned to Spain. It once again changed hands in the early 19th century and this time, finally to the newly formed country it currently belongs to, the United States. 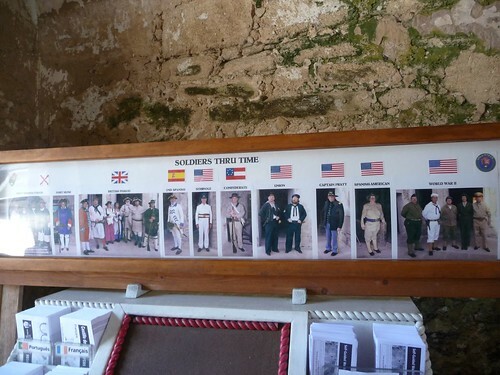 The photo above attempts to show what the occupying forces at each era and what they would have looked like. 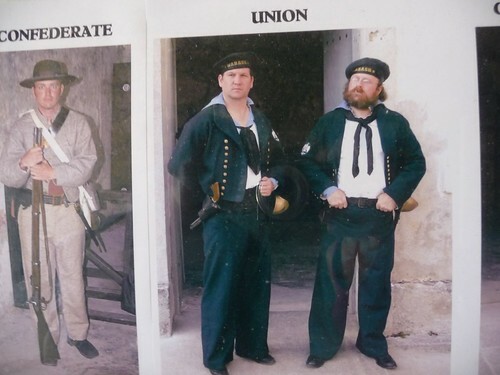 Check out these union guys after they took control of the south from the confederates. They don’t look too tough. Then again, that confederate guy next to them has his musket pointed at his own face. 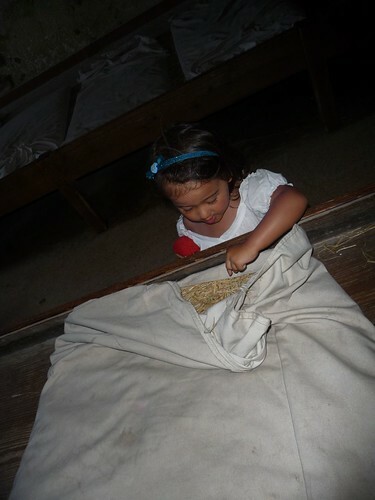 While we were there, they reenacted the transfer of power between the Spanish and the British. We watched it from the shade because it is just too damn hot today. How do these guys do it wearing all that garb? After the fort, we set out to do some more exploring in St. Augustine. 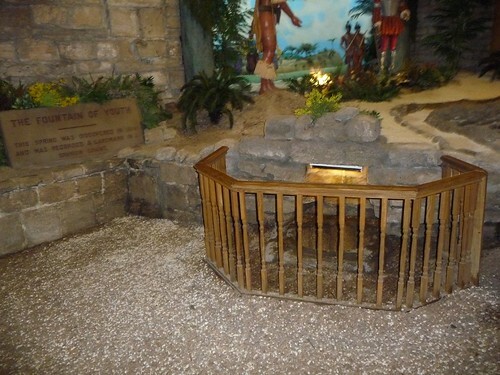 Specifically, we wanted to see the ‘Fountain of Youth’. The lady at the visitor’s center told us that it is ‘very walkable’. Sure she would think so. She sits in a chair all day in an air conditioned room. We walked and walked and walked until we just couldn’t walk anymore. 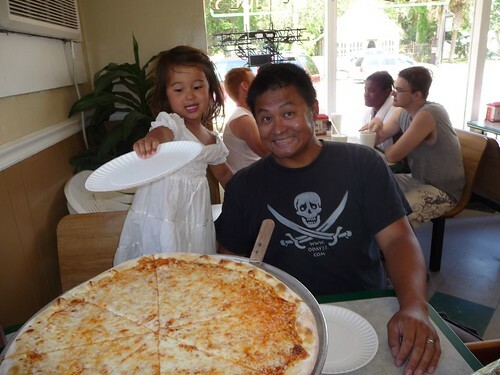 Luckily for us, we saw a pizza joint and we headed in for a quick bite to eat and something to rehydrate us. What we got, is a humongus New York style pizza that we somehow managed to eat in its entirety. Finally after sweating off the final few pounds I gained from Easter dinner, we arrived at the Fountain of Youth. Cursing the visitor’s center lady the entire way. 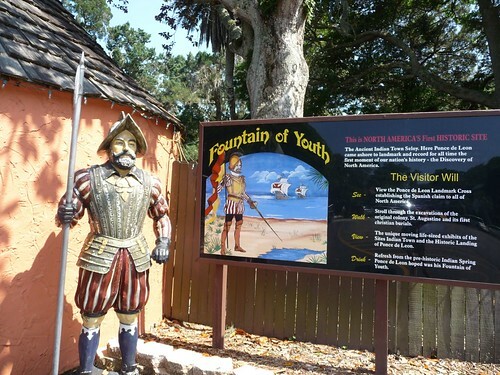 St. Augustine was founded by the Spanish explorer Juan Ponce de Leon. 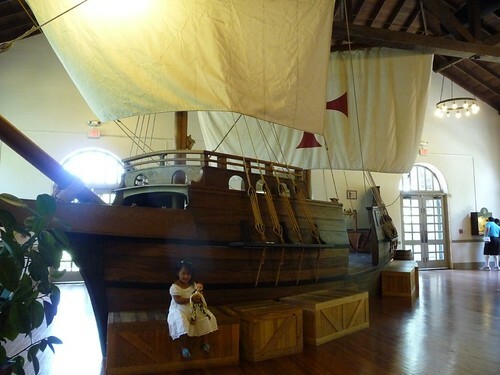 After arriving to Puerto Rico with Christopher Columbus and being appointed the first Governor of Puerto Rico, he lead the first expedition to Florida. 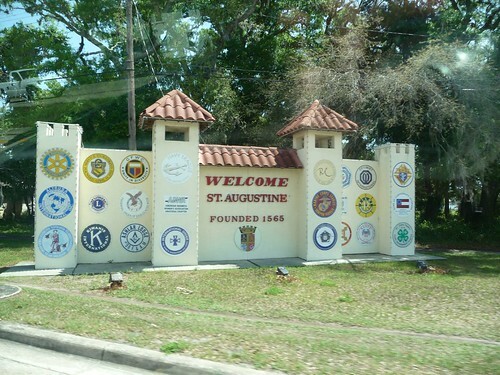 St. Augustine is where he landed. Hence the first settled city in the United States. The name La Florida (meaning Flowers) was the name given by him as he claimed the land for the Kingdom of Spain that stretched all the way across the North American continent. Wouldn’t you think he has to get across to the other side or at least know what is there before he can claim the whole thing? 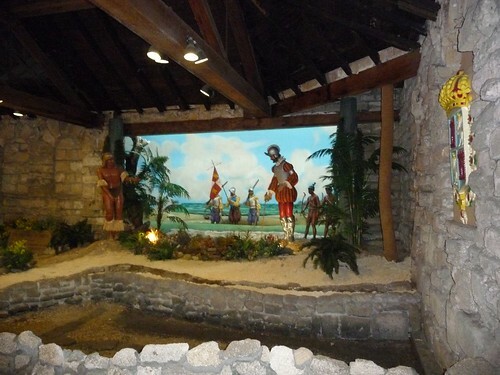 After coming ashore, Ponce de Leon came face to face with the native Americans who have been living and thriving here for many years. The chief of the native American tribe he met was a man supposedly over seven feet tall and in his sixties. Many people in his tribe at the time also lived to an exceptional old age for people in the early 1600s and many believe it was contributed partially by the consumption of this natural spring water very high in minerals. Today, the fountain still flows but it has since been enclosed in a structure and visitors are welcome to take a sip of the natural spring water with a very distinct sulfur smell. It really works. A moment ago this was Marlene. Aside from the fountain, there really isn’t a whole lot to see. We did sit in some of the other guide tours like a planetarium meant to show people how the European settlers used the sun, moon and stars to guide themselves across the Atlantic. As a sailor, it was interesting to me. But I think it bored Marlene to death. We walked back to Mali Mish and I was by now drenched again with sweat carrying and walking the pooped out Ava nearly a mile back. Maybe we should have taken the train tour. Tonight we head up to Jacksonville to spend our last night here in Florida and maybe try to rendevous with Marlene’s cousin Chris. Tomorrow, we will finally leave after an extended 2 months stay here. Next up, Georgia! Day 78: Little Talbot Island State Park.